Taking your horse camping or for an overnight trail ride can be a great experience, but securing him overnight is a challenge that you will need to plan for ahead of time. There are a few different ways to secure your horse, so depending on your situation and your horse’s behavior, you can pick the one that works best for you. 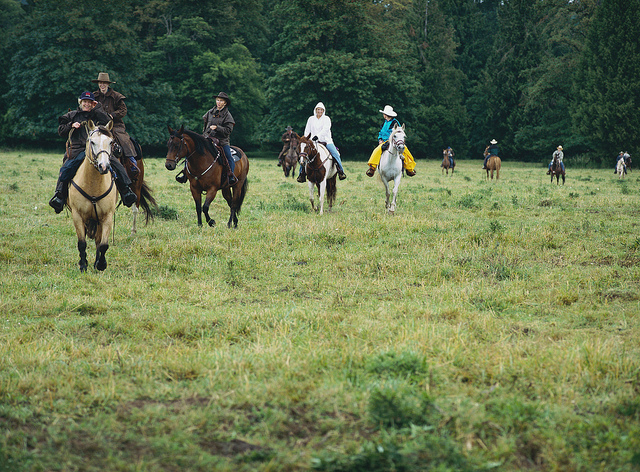 A picket line is a popular method of securing horses on overnight trail rides. Easily portable, a picket line can be constructed between two trees. Each horse is tied to the line individually, though the rope you use to secure your horse must be short enough so that your horse cannot get a front leg hung up in it. Because of this, a picket line does restrict your horse’s mobility at night, which means that it might not be a great option if you’ll be camping for several successive nights or if your horse is particularly restless or active. If you opt to use a picket line, it is of utmost importance that your horse tie well. A horse that does not respect being tied will be trouble and can disrupt the other horses who are tied. It’s best to practice with your horse at home to make sure that not only can he stand tied quietly, but that he can do so for extended periods of time. Hobbles are also sometimes used to secure horses when on the trail. They’re quick to put on, lightweight to carry, and require none of the assembly that a picket line does. Hobbles keep a horse at your campsite by restricting his movement. A horse must be taught how to stand with hobbles, and this instruction should begin long before you head out for your overnight ride. If a horse is unaccustomed to being hobbled, this method should not be used to secure him – doing so is likely to cause him to panic and could result in serious injury. Portable fencing is a great option if you will be camping overnight, especially if you’ll be camping for multiple days, since it allows your horse to move about freely and safely. Portable fencing is available in a variety of different forms. Portable fence panels can be used to assemble a solid corral, though they must be transported to a site via a truck or trailer. Portable electric fencing kits are also available, and they can be carried by a packhorse, making them an option for trail ride campsites. None of these options are as solid or sturdy as regular horse fencing, so your horse needs to be taught to respect the methods that you use to contain him. With a bit of preparation, you can find the right method to secure your horse alongside the trail.